Prince William is wearing glasses under his helmet and night vision goggles to correct his sight as he trains to be an RAF pilot, it has been reported. Generally, only people with perfect sight can become pilots under RAF rules. But the prince, said to be short-sighted, can still become a pilot because he is a serving Household Cavalry officer. RAF chiefs can consider Army and Navy applications to become pilots on a case-by-case basis. 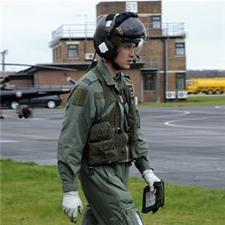 Prince William was snapped as he undertook his helicopter pilot training. He is hoping to become a search and rescue pilot and must wear the regulation RAF glasses to meet the required vision standard. Prince William is 26 years old and second in line to the throne. Having been an Officer Cadet at the Royal Military Academy Sandhurst, he became an army officer in 2006 and joined the Household Cavalry at the rank of Second Lieutenant.